The SW flow yesterday was on the lighter side, and the resultant sea breeze made it hard to figure out where the flying would work best. 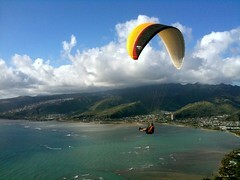 After a bit of para-chasing, four pilots ended up at Koko Head for a nice late afternoon soaring session. Big Island John, Fireman Dave, and Joey joined me out there, with ground support from John's friend Chihana, photographer Tim and Canada Brent, all of whom hiked up to the top. Joey had picked up Ginny so she could score some beach time while we flew - she is looking great, but she's going stir crazy stuck at home. Thanks again to Brent for the beverages! Ahhh, I remember a great day there when Ginny was helping Scrappy knock off a few tandem flights and Fireman let me use his FLX Octane... I remember Scrappy knocking off three of the best high wind tandem launches I have ever seen! Great day, and I am sure you guys scored it good.